The Bash Brothers are a duo of former baseball players consisting of Jose Canseco and Mark McGwire. Both prolific home run hitters, the two were teammates in Major League Baseball (MLB) for seven seasons with the Oakland Athletics, helping the team win a World Series title in 1989. The two began celebrating homers by bashing each other's forearms, which spawned a marketing campaign that was a takeoff on The Blues Brothers. After retiring from playing, Canseco and McGwire both admitted to using anabolic steroids during their careers. At the Oakland Coliseum, T-shirts and banners bore "Let's Bash". A song and complementary music video was made to the tune of "Monster Mash", the 1962 hit by Bobby "Boris" Pickett, with almost a dozen radio stations placing the new "Monster Bash" on their playlists. Costacos Brothers Inc., an innovative poster company, had already planned a photo shoot with the slugging duo for a concept that was originally titled "The Blast Brothers", but the advent of the forearm bashing motivated a change to the "The Bash Brothers". The poster was patterned after characters popularized by comedians Dan Aykroyd and John Belushi. Canseco and McGwire were made to look like a bigger and meaner version of The Blues Brothers who were also partial to some yellow in their attire—yellow being an A's team color along with green. Wearing black suits, black shoes, black hats, black sunglasses, yellow socks, yellow shirts, skinny ties, and fedora hats, the duo posed in front of an Oakland Police patrol car while holding giant 5-foot (1.5 m) baseball bats. The poster sold 50,000 copies in the San Francisco Bay Area in less than three weeks. It was as popular as any poster that Costacos had done, and it received immense press coverage. Due to the frequency and distance of their home runs, the Bash Brothers were a popular attraction in every American League city. 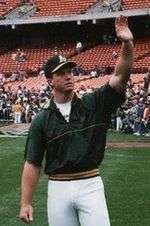 McGwire became the first player in major league history to hit 30 home runs in his first four seasons (1987–1990), and Canseco led the majors in homers for the second time with 44 in 1991. However, the Athletics finished in fourth place in the AL West in 1991 after having made three straight trips to the World Series. At the trade deadline in 1992, Oakland traded Canseco to the Texas Rangers for outfielder Rubén Sierra, relief pitcher Jeff Russell, and starting pitcher Bobby Witt. The A's at the time were 27 games above .500 and leading their division by 7 1⁄2 games, but they had played 34 of 131 games without Canseco, and were seeking to strengthen their pitching. He had homered 231 times with the A's since 1985, and was arguably the biggest celebrity in baseball at the time. However, Canseco had played over 135 games in a season just once since 1988, and his off-the-field antics had drawn criticism as well. ↑ Neff, Craig (April 14, 1986). "Those Baby Boomers". Sports Illustrated. Archived from the original on April 9, 2015. ↑ Walker, Ben (April 6, 1986). "Which Rookie Will Rise to Major League Stardom This Year?". Los Angeles Times. Archived from the original on April 9, 2015. 1 2 3 Wilstein, Steve (October 11, 1987). "A Year to Remember". Los Angeles Times. Associated Press. Archived from the original on April 8, 2015. 1 2 "MCGWIRE ON HALL OF FAME BALLOT FOR SIXTH TIME". National Baseball Hall of Fame and Museum. Archived from the original on April 9, 2015. 1 2 3 4 5 6 Curry, Jack (February 13, 2005). "For Canseco and McGwire, Little Brotherly Love". The New York Times. Archived from the original on April 8, 2015. 1 2 Berg, Ted (July 24, 2014). "Mark McGwire on Jose Canseco: 'I don't care to ever speak to him again.'". USA Today. Archived from the original on April 8, 2015. 1 2 Shapiro, Mark (January 28, 1997). "Canseco Trade Reunites Bash Brothers". Chicago Tribune. Archived from the original on April 8, 2015. ↑ Chass, Murray (November 17, 1988). "It's Unanimous: Canseco M.V.P.". The New York Times. Archived from the original on April 9, 2015. 1 2 3 4 Wilstein, Steve (October 16, 1988). "Bash, it's a smash". Santa Cruz Sentinel. Associated Press. p. B-6. Retrieved April 7, 2015 – via Newspapers.com. ↑ Stevenson, Seth (November 27, 1997). "Signs and Wonders". Slate. Archived from the original on April 10, 2015. 1 2 "The Bash Brothers". The Register-Guard. June 18, 1988. p. 2C. Retrieved April 8, 2015. 1 2 "Oakland hitters Bash their way into spotlight". Chicago Tribune. April 27, 1988. Section 4, p. 2. Retrieved April 10, 2015. ↑ Davis, Craig (September 5, 1988). "Big Bash Theory Helps Create A World Of Wins For Athletics". Sun-Sentinel. Archived from the original on April 8, 2015. 1 2 3 Tafoya, Dale (2008). Bash Brothers: A Legacy Subpoenaed. Potomac Books. p. 138. ISBN 9781597971782. Retrieved April 10, 2015. ↑ Stewart, Mark (2008). The Oakland A's. Norwood House Press. p. 14. ISBN 9781599531700. Retrieved April 10, 2015. ↑ Penner, Mike (October 14, 1988). "THE WORLD SERIES: ATHLETICS vs DODGERS : NO WONDER THESE GUYS GET . . . STRAIGHT A'S". Los Angeles Times. Archived from the original on April 8, 2015. ↑ Shea, John (May 24, 1998). "McGwire glad to see Brother is holding up his end again". San Francisco Chronicle. Archived from the original on April 8, 2015. 1 2 Kurkjian, Tim (April 27, 1992). "A's O.K. If you counted the Oakland Athletics out, count again. They're flying high once more". Sports Illustrated. Archived from the original on April 9, 2015. ↑ "MAJOR LEAGUE ROUNDUP : Fielder, Canseco Are Stuck on 44 at the Finish". Los Angeles Times. Associated Press. October 7, 1991. Archived from the original on April 9, 2015. 1 2 3 Jaffe, Chris (August 31, 2012). "20th anniversary: Canseco trade". The Hardball Times. Archived from the original on April 8, 2015. 1 2 3 Montville, Leigh (September 14, 1992). "Texas-sized Trade The Oakland A's sent superstar Jose Canseco to the Rangers in a deal that was both bold and bewildering". Sports Illustrated. Archived from the original on April 8, 2015. ↑ Newberg, Jamey (August 23, 2007). "Swapping Stories: The Canseco trade". MLB.com. Archived from the original on April 8, 2015. ↑ "Canseco Arrives at Last". The Washington Post. March 23, 1997. Retrieved April 8, 2015 – via HighBeam Research. (subscription required (help)). 1 2 3 Anderson, Lars (March 10, 1997). "4 Oakland Athletics". Sports Illustrated. Archived from the original on April 8, 2015. ↑ Silverman, Michael (January 25, 1997). "Sox trade Jose to A's; Pick up righty Wasdin". The Washington Post. Retrieved April 8, 2015 – via Highbeam Research. (subscription required (help)). 1 2 Kettman, Steve (August 5, 1997). "A's Made A Big Mess Of Things". San Francisco Chronicle. Archived from the original on April 8, 2015. ↑ "Worst baseball deadline trades". ESPN.com. August 8, 2002. Archived from the original on April 9, 2015. ↑ Camps, Mark (February 28, 1998). "Canseco Is Still a Threat at the Plate". SFGate.com. Archived from the original on April 8, 2015. ↑ Riess, Steven A. (2006). Encyclopedia of Major League Baseball Clubs. Greenwood Publishing Group. p. 788. ISBN 9780313083068. Retrieved April 7, 2015. 1 2 Diaz, George (May 2, 2001). "Slugger For Hire". Orlando Sentinel. Archived from the original on April 8, 2015. 1 2 Antonen, Mel (May 15, 2002). "Canseco's retirement stirs Hall debate". USA Today. Archived from the original on April 8, 2015. ↑ "N.L. 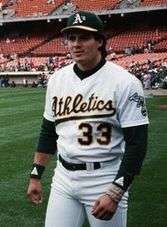 ; Jose Canseco Retires, 38 Homers Shy of 500". The New York Times. May 14, 2002. Archived from the original on April 8, 2015. ↑ Fine, Mike (January 12, 2010). "Mark McGwire admits using steroids – who's next?". The Register-Mail. Archived from the original on April 8, 2015. ↑ Kepner, Tyler (January 11, 2010). "McGwire Admits That He Used Steroids". The New York Times. Archived from the original on April 9, 2010. 1 2 3 Curtis, Bryan (January 8, 2014). "The Steroid Hunt". Grantland. Archived from the original on April 8, 2015. ↑ Caple, Jim (April 29, 2013). "Game changer? It was in the cards". ESPN.com. Archived from the original on April 8, 2015. 1 2 3 Vecsey, George (January 12, 2009). "Voters Cannot Forgive or Forget Suspicions of McGwire's Drug Use". The New York Times. Archived from the original on April 9, 2015. ↑ Roberts, Selena (August 26, 2005). "Truth Has Been Sullied Too Many Times". The New York Times. Archived from the original on April 9, 2015. 1 2 Hancock, David (February 10, 2005). "Steroid-User Canseco Names Names". CBSNews.com. Archived from the original on April 8, 2015. ↑ Saxon, Mark (July 24, 2014). "McGwire on Canseco: 'It's too late'". ESPN.com. Archived from the original on April 9, 2015.